This week's edition of Antelope Intros features two University alumni. One is a former track athlete who loves spreading her faith. The other is an avid traveler with a passion for education. What attracted you to GCU? Before my freshman year of college, I had been searching for a new start. I had the typical freshman ideal: I wanted to start an entirely new life with new friends and brand-new social experiences. All of my friends had mentioned that they would be attending Grand Canyon University — therefore, I wanted a different option. Nevertheless, my mom convinced me to check it out. I met with an SSA (student services advisor) and took a campus tour. It was very strange because everything that I had imagined was at GCU! It had the most amazing academic programs (especially in Theology), a beautiful campus, an off-the-charts student life and several opportunities for student leadership. At that point, I could see myself waking up every single day excited to attend and work for the University. My experience at GCU as an undergraduate student, athlete and campus leader only served to further develop that desire into a passion. Now, I work for the College of Theology as an administrative assistant to the dean and I could not be more pleased with the manner in which God has worked in my life and the manner in which I have the privilege of seeing Him work in the lives of those around me. What do you do for fun and where do you find that outlet? I am an avid shopper and sports enthusiast. You can count on me arriving on time and ready for action for anything that has to do with those two things. What are you passionate about? My faith is the most important aspect of my life. A few years ago I made a painting of the sun and the word “resonate” in the middle. When most people think of “resonate,” they think of how sound resounds off the walls in every corner of a room. However, when I think of “resonate,” I think of the sun. The sun shines, impacts and surrounds everything that it comes into contact with. My desire and my passion are to impact the world in the same manner that the sun impacts the earth. I desire to shine upon, impact and surround everyone I come into contact with, with the love of God – that same love that drove my desire to become a Christian at a young age and developed my life as it is at today. What are your favorite places or events in the Valley that you like to visit? I am a very random individual when it comes to events I attend. As long as it is within my line of interest — art, athletics and shopping — I will be there! I love to shop at farmer’s markets in Phoenix. They always have something random or new to taste, take home or put in my office for decoration. I also enjoy the Tempe Marketplace because the view is amazing and the Tanger Outlets mall always has a a great sale. Tell us something about yourself that most people don’t know: I have traveled to the Middle East, England and Mexico (three times) for mission trips. What are you most proud of? 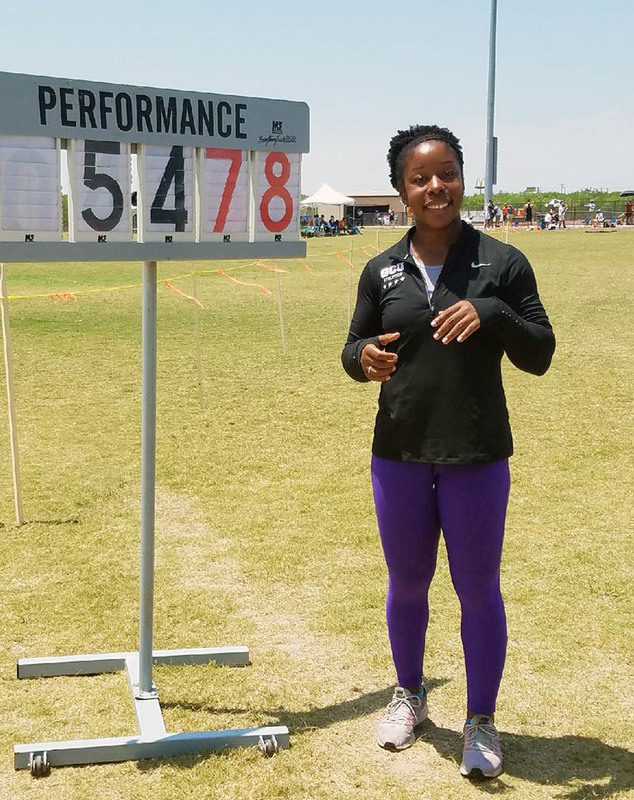 In my final year of athletics, God allowed me to experience something amazing as a member of the GCU Women’s Track and Field team. At our conference championships I received second place in shot put (I was seeded 10th), second place in the hammer throw and fifth place in the discus throw (I was seeded eighth). I also won the “Western Athletic Conference Most Outstanding Field Performer” award. This was an award that I had been pursuing since my freshman year! So, it was a wonderful way to end my D-I collegiate athletics career. What attracted you to GCU? 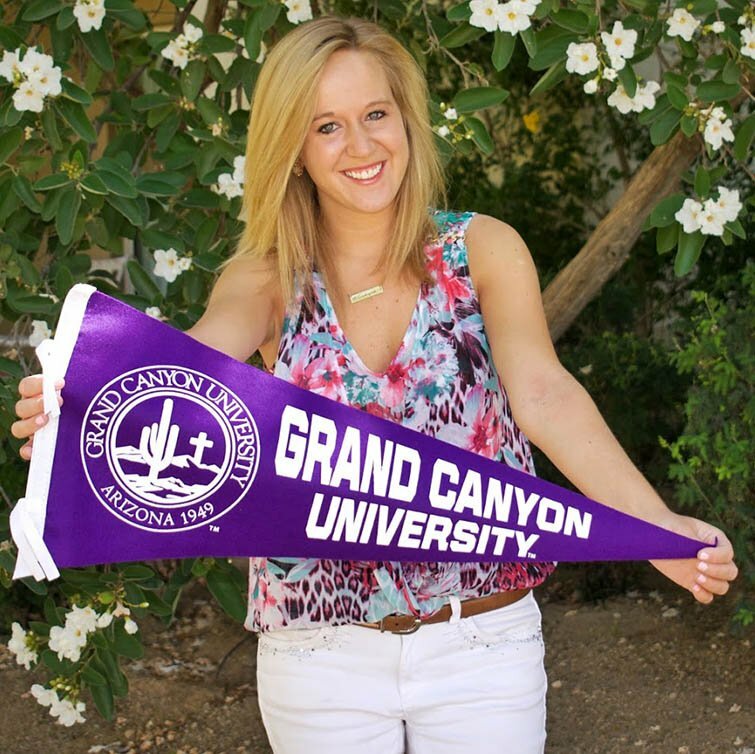 When I was researching where to complete my undergraduate degree in elementary education, I loved the positive elements I saw in Grand Canyon University. I was attracted by the enthusiastic school spirit, the dedication to helping the community and the amazing school culture that I have grown to love both as a student and now as a full-time employee. And obviously, my favorite animal is an antelope! What do you do for fun and where do you find that outlet? I love traveling and adventuring with my friends and family whether across the country on a boat on a lake in Maine, a quick trip to the sunny beaches of San Diego or trekking around Arizona. Traveling has always been one of my passions. I also like to check out local brunch places and am always open to suggestions! What are you passionate about? During my student teaching experience, I fell in love with teaching and working with students. I have a passion for doing my part to help engage students in learning and allowing them to find the purpose of a great education. What are your favorite places or events in the Valley that you like to visit? I moved to Arizona about three years ago from Colorado and I am still finding new places to explore. Just last week, I went to Papago Park and watched the sunset while perched on a high red rock. It was incredible and there truly is nothing like an Arizona sunset. Tell us something about yourself that most people don’t know: Before coming to GCU, I completed my associate’s degree in American Sign Language interpretation. I am fluent in ASL and have always been fascinated by the deaf culture. What are you most proud of? I had the unique opportunity to be asked by the dean of the College of Education to represent the Class of 2017 as the commencement student speaker this past April at the traditional undergraduate ceremony. I was honored to be asked and enjoyed every moment of this opportunity. I do have to ask myself though, is it possible to reach your peak at only 24 years old?